Dolly Rocker Girl: "I want to be a living work of art." "Women of the world today all dress alike. They are like so many loaves of bread. To be beautiful one must be unhurried. Personality is needed. There is too much sameness. The world seems to have only a desire for more of this sameness. To be different is to be alone." No woman in the early half of the twentieth century was as decadently eccentric as the Marchesa Luisa Casati, the most notorious Italian heiress that has ever lived. Arguably the first true female dandy, Casati famously proclaimed that her life's goal was to become "a living work of art." Born Luisa Adela Rosa Maria Amman in Milan in 1881 to a wealthy Italian family with royal heritage (her father was made a Count by King Umberto I), her parents death at age 15 left Luisa and her older sister Francesca the wealthiest women in Italy. She wed Camillo Casati Stampa di Soncino, Marchese di Roma in 1900. After the birth of their only daughter, Luisa left her husband and daughter in 1914 in order to reinvent herself as a patroness of the arts. Standing at a near six-feet-tall and dressed in flamboyant European fashions, the Marchesa both delighted and horrified the aristocratic belle epoque. With her fiery red hair teased to a halo of curls and large, overwhelming green eyes - which she exaggerated with both thick rings of kohl and belladonna drops to enlarge her pupils to appear like emeralds - Luisa was like no other woman Italy had ever seen. She was deathly pale, with a cadaverous bone structure, and always kept her lips painted in her signature deep vermillion red. After separating from her husband, the Marchesa moved into the Palazzo Venier dei Leoni, a semi-ruined mansion along the Grand Canal in Venice that would play house to all her future exploits. Tales of her wildly eccentric personality are notorious. She wore live snakes as necklaces. She had male servants wear nothing but a sheet of gold leaf in her decaying Venetian mansion, which was decorated with wax mannequins which she placed in seats at the dinner table, and Chinese lanterns throughout the vast property. Infamous for her late-night walks, the Marchesa would stroll around the city with her two pet cheetahs on diamond-studded collars and leashes, while she wore scant more than a fur coat. Around the Palazzo roamed her exotic pet cheetahs, monkeys, peacocks and birds. In Venice she threw extravagant parties - masquerade balls, gothic black masses, and performances of the Russian ballet. Rumors of her party time attire still swirl - once the Marchesa was said to have worn a freshly-slaughtered chicken as a stole. Another party had her dressed in nothing but white feathers streaked with blood dried on her arms. During the three decades that she mesmerized the Venetian society, she had affairs with both men and women, but her constant love was writer Gabriele D'Annunzio. A celebrity among the literati set, she was painted by Augustus John, Giovanni Boldini, Romaine Brooks, Kees van Dongen, and Picasso, photographed by Cecil Beaton and Man Ray, sculpted by Paolo Troubetzkoy, sketched by Drian and Alastair, and the inspiration of Erte, Jean Cocteau, Robert de Montesquiou, and Jack Kerouac. Some 200 portraits, sculptures, and drawings were made of her, as she wished to "commission her own immortality." She was also a patroness of fashion designers Poiret and Fortuny, and served as muse to Umberto Boccioni, Fortunato Depero, and F.T. Marinetti. Her affinity for exotic animals and jewels directly inspired Cartier's panther design. By 1930, Casati's passion for couture, expensive jewels, and other extravagancies left her virtually penniless, in debt for $25 million. An auction of her personal collections drew many bidders, including Coco Chanel. Casati then moved to London, where she resided until her death in 1957. In those years, the fallen heiress was rumored to be seen digging around Mayfair trash bins for plumes of feathers to wear in her hair. After her death, she was buried in her finest black leopard skin piece, a pair of false eyelashes, and her taxidermied Pekinese dog. On her gravestone in Brompton Cemetery is a quote from Shakespeare's Antony and Cleopatra, "Age cannot wither her, nor custom stale her infinite variety." Despite living her final days in poverty, the enigmatic persona of the Marchesa lives on and continues to inspire. She is the namesake of the fashion house Marchesa, and is a personal icon of the house's designers Georgina Chapman (who recently posed as Casati in the March issue of Harper's Bazaar) and Keren Craig. Of Casati, Chapman has said, "Perhaps if she were alive today, she would be a designer. She squandered all of her money. Millions and millions. It's a good take on what's happening now. Her life was one of complete excess; then she had to reassess everything." Other designers, such as John Galliano and Karl Lagerfeld, have looked to the late Marchesa for inspiration. Dita Von Teese has cited her, as well as Anna Piaggi and Isabella Blow, as a key style influence. She has also inspired many film characters, including Isabella Inghirami in Forse che si forse che no, La Casinelle in Dans la fete de Venise and Nouvelle Riviera, Ingrid Bergman's character in A Matter of Time, as well as Vivien Leigh's performance in La Contessa. 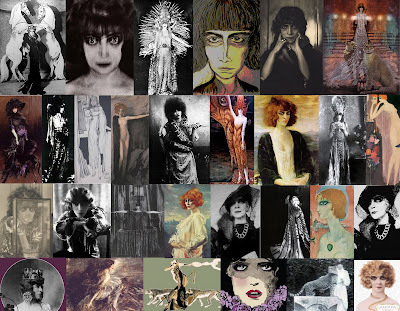 The life of Marchesa Luisa Casati was remarkable, and, at times, almost unbelievable. I adore her because she was truly an individual and became her life's wish: a living work of art. She lived for her self and her pleasure, and dared to do things that few others could even dream of. I am eager to purchase the biography of her life, Infinite Variety: The Life and Legend of the Marchesa Casati, and learn more about this fascinating figure in history. I definitely want to read that book as well. Lovely, and so beautifully written. Casati said some really eccentric and wonderfully beautiful and true things. I really want to read Infinite Variety to find more quotes. I too loved Martini's quote - I hope to one day become a slave to my own dream world!! Your blog is lovely as well. I stumbled across and found myself captivated. Please visit my personal blog sometime, follow if you like.